​MagnifyAds gets you listed on the 1st page of Google fast by creating custom optimized HD Videos that are coded and embedded to out-perform your competition. 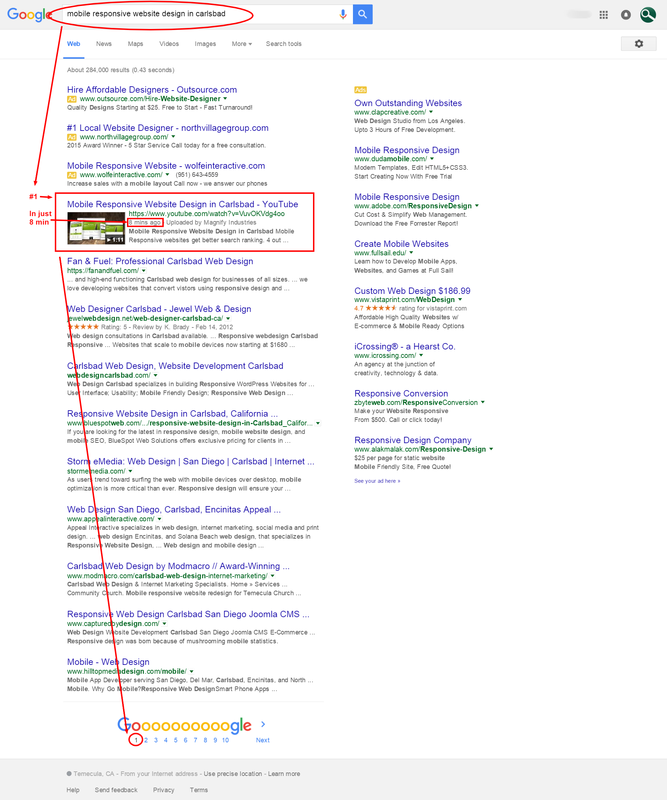 Google owns YouTube and when YouTube ranks you as the local leader, the link to your YouTube video, along with a thumbnail of your video, appear highlighted on the front few page of the results, dominating Google. Video SEO is currently the fastest and the #1 way to dominate your local competitors within just a few weeks. Saturate the first few pages of Google in your area by dominating the first page of YouTube with optimized video seo from MagnifyAds! Unlike other forms of SEO investments, investing in an HD video marketing tool is like having an HD business card, online and alive for people to interact with day or night. These videos are assets that will not only get you seen, but can be used time and time again into the future. Unlike traditional search engine marketing, our service can achieve 1st page results with no changes to your website at all. MagnifyAds Videos are Full HD and Full Broadcast Ready too! ​On Google the organic links are boring blue link headlines that take you to websites. But with YouTube, the link to your video shows up in the boring blue link organic section of Google with a big colorful thumbnail image of your video, making it jump off the page and draw every eye. These videos are not to win awards, they are to win the short attention span of a potential customer so they click on your link that leads to your information first. We are not only creating a tangible full HD marketing asset, but we are embedding code into the videos and performing heavy optimization to YouTube so that your videos get you noticed ahead of your competitors, on YouTube and most importantly on Google! ​Our Clients were the first to receive this now heavily proven marketing strategy. "IT'S LIKE MAGIC" -Cindy L.
"I'm amazed, but it really Does work." -Tom H.
"WE HAVE 3 VIDEOS ON THE FRONT PAGE AND IT'S BEEN 3 WEEKS!" -PAUL C.
"VERY IMPRESSIVE RESULTS. MY VIDEOs are ON PAGE 1 in just four WEEKS." -JAMES P.
​►There is no limit to the amount of videos you can create to saturate cities, services, neighborhoods, any search term. This not only helps to get you noticed on Google and YouTube in a big way, but it also helps your website's ranking position. We not only create these video products for you, we syndicate them through over 50 verified and established YouTube and media channels so that your domain, mentioned in each video description, receives backlinks from each of the 50 or more pr8 and pr9 media sites. Video SEO is a 1 time fee and the HD marketing videos are yours to keep and use on your website or local commercials, radio (voice over narration file can be supplied separately) or in any other way you want. *Typical videos start at $350 each or 3 for $999 and include syndication. One time fee. Results are lasting. Medium and low competition search phrases only. Contact us today and be getting phone calls in just a few short weeks from people that found you because of your proactive marketing videos!